Your dinner (and appetizer) options are endless when you have shredded chicken on hand. Whether you're in the mood to use your slow cooker, stove top or Instant Pot, you can make great chicken for shredding. Change up your seasonings regularly so you can eat shredded chicken often, without taste bud burnout setting in. 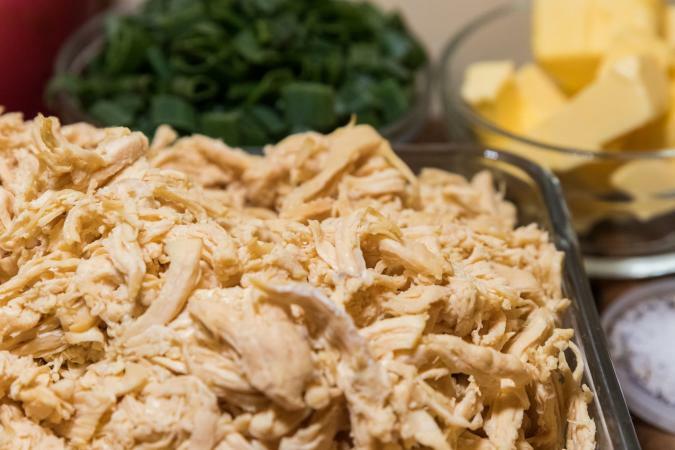 Use this basic shredded chicken recipe to prepare your chicken, regardless of which cooking method you choose. Your instructions for the shredded chicken recipe depends on the cooking method you choose. Place chicken breasts in a slow cooker. Top with oil, seasonings, and broth. Cook in slow cooker on low heat for 6 to 8 hours (or on high heat for 3 to 4 hours). Shred chicken using two forks. Place chicken breasts in a large saucepan, and add water until chicken is covered. Bring mixture to a boil over medium heat, and simmer about 12 minutes (until chicken is no longer pink). Place chicken in a bowl to let it cool, and toss out remaining water. Shred chicken with a fork, and place it back in your large sauce pan. Add broth until moist, oil and seasonings. Heat over medium heat until shredded chicken mixture is heated throughout. Place chicken in your Instant Pot, and season both sides of the chicken with seasonings above (or those of your choice). Press the poultry button on your pot, and let chicken pressure cook on high for about 25 minutes. Remove chicken from pot to cool, shred it, and serve! Shredding chicken is fairly simple, and requires just cooked chicken and two forks. Slice your chicken on a cutting board. Use two forks to shred it into stringy strips. Put the fork tines across from each other in the strips and pull gently to shred chicken. Continue shredding until you finish. You can also use an electric mixer (use the low setting for about 2 to 3 minutes) to shred chicken. Use the following shredded seasonings when you want to veer away from traditional flavors. To use one of these seasonings following the methods above, simply swap them out for the seasonings in the ingredients list above and continue with the instructions. Change things up a bit when you're in the mood for Mexican food. If you want spicy, this seasoning recipe won't let you down. Try this shredded chicken seasoning blend when you're in the mood for a smoky flavor. You have tons of options when it comes to seasonings for shredded chicken. Try chicken rub recipes such as barbeque chicken rub, garlic and herb rub, or Mediterranean rub. Other shredded chicken seasoning options include nutmeg with sage, savory seasonings, and herbal chicken blends. You can't go wrong when choosing shredded chicken for your next meal or party appetizer. Use it in soups, salads, sandwiches, casseroles, quesadillas, tacos and omelets -- or simply eat it plain. Changing up your seasonings means you can enjoy shredded chicken several days each week without feeling bored!